Can we preserve a traffic jam? “Can we preserve a traffic jam?” After I spoke at Postopolis LA! on experimental forms of history, BLDG BLOG’s Geoff Manaugh asked me this question. The question was meant genuinely, and also as a provocation, testing the limits of the experimental forms of spatial history that I had just discussed. Just a few weeks ago, We make money not art, posted a review of the traffic jam created by artist Maider López. 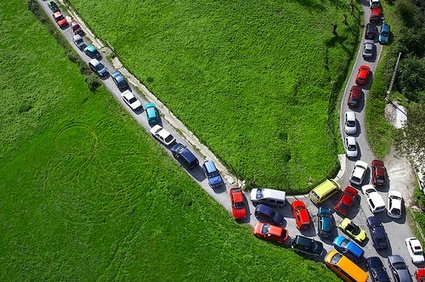 López asked a large group of people to drive their cars into a well choreographed jam within a hilly area of Spain (below). 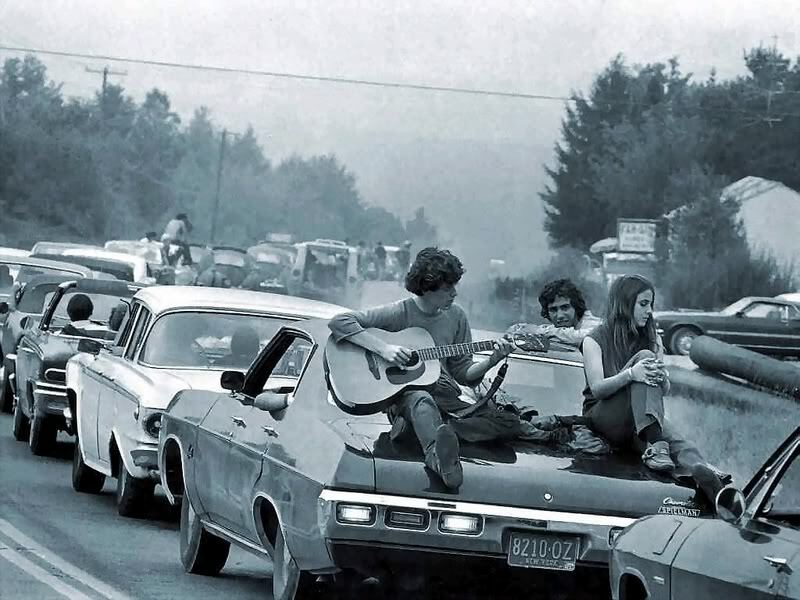 The traffic jam looks suspiciously like the traffic jam (above) that stretched from the Catskills into lower New York State during the Woodstock music festival of 1969. This recent project suggests that — yes — it is now possible to preserve a traffic jam. I know the guy playing guitar in this photo. His name is Damien Reynolds and he lives in Chicago. “Still, as eyewitnesses have attested, to truly comprehend the magnitude and impact of both culturally momentous events, you really had to be there. And in the case of Woodstock, it probably helped to have avoided the brown acid. In a case of right place, right time, Reynolds — who moonlights as an illustrator — had been strumming a stranger’s guitar with his female companion (named Bobbie, she hailed from a well-off family in Indianapolis) on the trunk of a slow-moving Chevy Impala when Rolling Stone magazine’s first chief photographer, Baron Wolman, happened by and captured the moment on film.